Today, October 19, Bulgarian Orthodox Church honors Saint John of Rila (St. Ivan Rilski).He is honored as the patron saint of the Bulgarians and as one of the most important saints in the Bulgarian Orthodox Church. 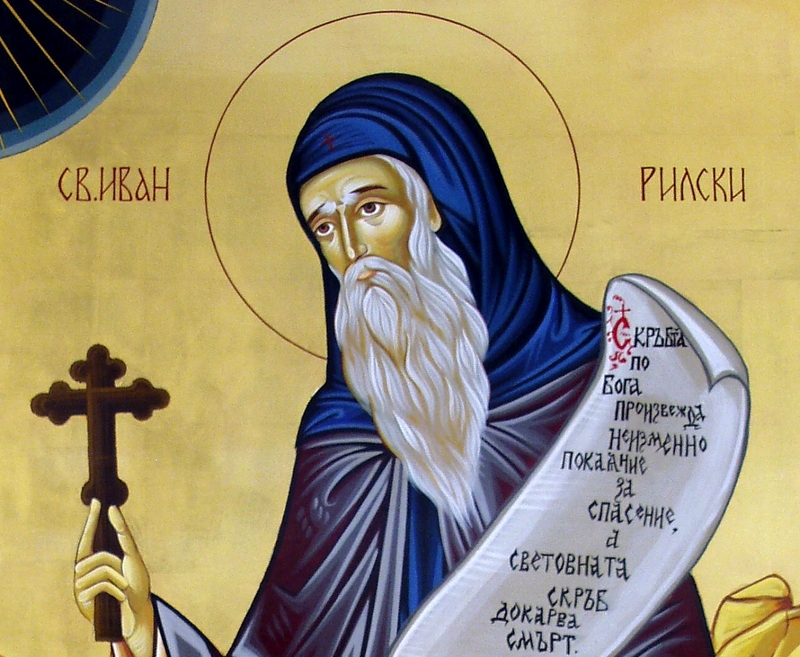 St. Ivan Rilski is patron of numerous temples and monasteries in Bulgaria, among which he founded the Rila Monastery. According to tradition, on the eve of the feast of the monastery is done vigil, which traditionally attended by hundreds of pilgrims from all over the country. During the day there is held a festive Divine Liturgy. Patronal festival celebrated Sofia Seminary "Sv. Ivan Rilski". It is assumed that the saint was born around 876 in the village Skrino near today's town of Dupnitsa. As a youth he was a shepherd. He entered the monastery "St. Demetrius" in Vlahina, where he received training and took the monastic vows. Not stay long in the monastery and devoted to living in complete solitude, prayer, fasting and privation. He toured a lot of places around the Bulgarian territories, while settled in the Rila Mountains, where he remained until the end of his life and founded the eponymous monastery. Ivan Rilski died on 18 August 946 years, and was buried in the narthex of the church of the monastery, in a stone tomb, which is still preserved. Soon after his death, his remains were moved to Serdica (now Sofia) and probably then and was canonized. In 1183, during another Hungarian-Byzantine war, the Hungarian King Bela III took Sredets and referred the relics of St. John in its capital Grand Prix, in 1187 the relics were returned to Serdica, and in 1194-1195 was carried over the then capital of Veliko Tarnovo. Since 1469 the saint's relics were returned to Rila Monastery renewed. For more than 20 years ago, on the initiative of the Bulgarian Medical Association on 19 October marks the Day of the Bulgarian doctor as St. Ivan Rilski was declared patron saint of physicians.